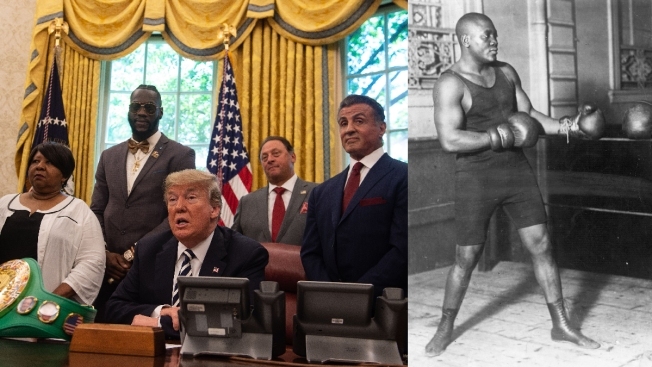 President Donald Trump speaks before signing a posthumous pardon for former world champion boxer Jack Johnson (far right) in the Oval Office at the White House on Thursday, May 24, 2018, joined by heavyweight champion Deontay Wilder and actor Sylvester Stallone. The Justice Department makes decisions on potential pardons through an application process and typically makes recommendations to the president. The general DOJ policy is to not accept applications for posthumous pardons for federal convictions, according to the department's website. But Trump has shown a willingness to work around the DOJ process in the past.